Hi All. First post here. I just picked up a new 2019 C and have set up all the Mercedes Me services that I need (i.e Remote start, door unlock, etc). 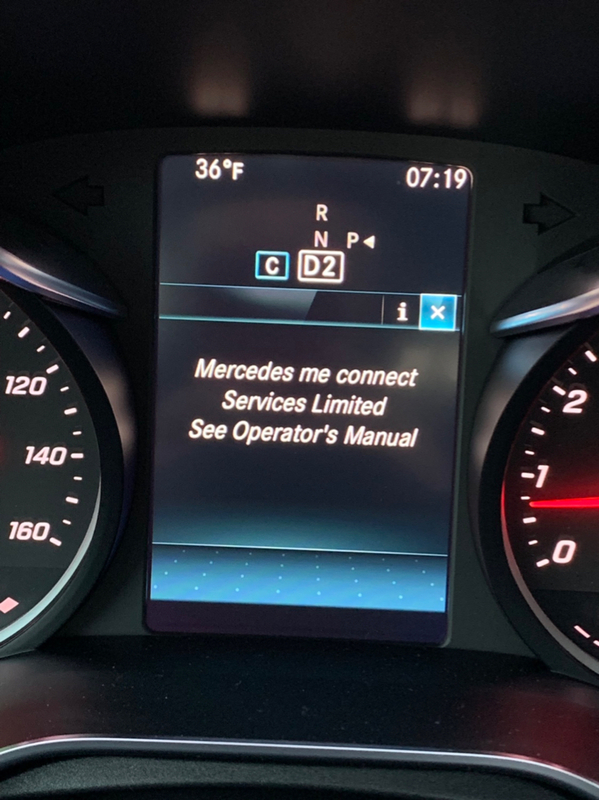 My question is on the MY2019 (not sure if other years have the same issue), when I start the car there’s a “Mercedes Me limited services message on the center console that needs to be closed via the “x” button which can be done via the steering wheel buttons. Is there a way to disable this message or to ge the car to start on another “panel”? Here’s a pic of the message. Update: I took the car in yesterday and the dealer service checked everything with the car and gave it a clean bill of health. That being said, Mercedes Me service seems to be having issues with the service which needs to authenticate through severs in Germany when connecting to the car. The car, when turned on and staring to drive tries to connect and cannot (probably times out) and displays the error above). Eventually after, the car may obtain a connection by that time it’s too late and the drive probably already has “closed” out the error message. Mercedes support has acknowledged this issue as other have complained about this issues as well. The dealership has also confirmed others stating the same issue. Hopefully this will be resolved soon as it is totally a PIA to have to close out this message every single time and especially if it causes problems with connectivity and usefulness of the Mercedes Me service.